Cricothyroidotomy is an emergency procedure that is performed when the patient's airway is blocked and less invasive attempts to clear it have failed. A surgical airway is created by making an incision in the cricothyroid membrane and inserting a tracheostomy tube into the trachea. Cricothyroidotomy is a skill with relevance to both military and civilian medical practitioners. Current training methodologies using animals, cadavers, and mannequins have shortcomings. We are developing a computer-based cricothyroidotomy simulator which uses a hand-immersive platform with 3D graphics for the visuals and haptics for a sense of touch. Touch is provided by two haptic devices, one per hand, to facilitate bimanual training. The hand-immersive platform helps preserve the surgeon's hand-eye coordination. 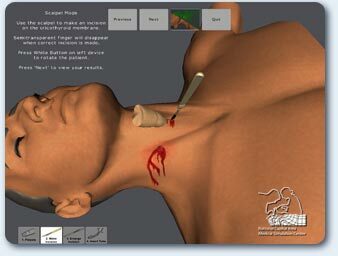 The simulator incorporates a virtual patient with a detailed model of the neck region. Different tissue types are encoded with different stiffness properties. Using the simulator, students can palpate the virtual patient and feel the thyroid and cricoid cartilage. The simulated surgical instruments can be controlled with either hand, based on the student's dominant handed. The virtual patient bleeds when an incision is made, and the student can feel resistance similar to an actual procedure. The haptic devices can also be used to change the orientation of the patient. The simulator has two modes, "Mentor" and "Test". Mentor mode, which can display the underlying anatomy, guides the student through the procedure using on-screen instructions and immediate performance feedback. With the Test mode the user performs a cricothyroidotomy without any of the Mentor mode guides. In this mode the user has a time limit for completing the procedure. Causing injury to the patient (e.g. making long/deep incisions) deteriorates the patient's state and decreases the amount of time provided to perform the task. A performance summary is generated in the end. A prototype simulator was deployed in Iraq. Initial feedback suggests that that system can be useful for providing field training and practice to incoming clinicians. When complete, the simulator will incorporate didactic content, multiple patient types and scenarios, and a virtual model of human physiology to provide trainees with a realistic environment for learning and practicing the procedure. The next two videos demonstrate the cricothyroidotomy simulator. The first shows the simulator in "Mentor" mode and the second shows "Test" mode. This video shows the anatomy of the cricothyroid region.